A large Edwardian property offering spacious, comfortable and clean accommodation for holidaymakers, business guests and short or long stay visitors. We offer you a warm, friendly and relaxed atmosphere to help you unwind whilst you are visiting and enjoying your stay in Eastbourne. A lovely garden with seating is available for you to sit and relax in during the warmer months. We are easy to find on the A2021 where free parking is available both on site and alongside our guest house. 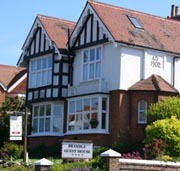 We are located less tha 2 miles from Royal Eastbourne Golf Club. 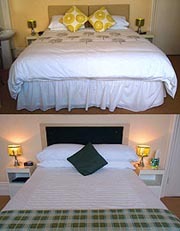 All our rooms are comfortably furnished, bright, centrally heated and very spacious. Each room has a tea and coffee making hospitality tray, hairdryer, iron and ironing boards and clock radios for those who wish an early start! All bedrooms are equipped with the latest flat-screen digital Colour TVs. Access is available to your bedroom at all times so you may come and go as you please throughout the day and evening. We have family (for three or four persons), double, twin or single bedrooms available including a ground floor double en-suite bedroom for those who have difficulty with stairs. Our rooms are located either on the ground or first floor. We are a non smoking establishment but there is seating outside, in the garden, for those in need. A cot is available for babies at no extra charge. We are open all year round, and pets are welcome (with prior arrangement). Free WiFi Broadband is available.